A common mistake made in tax preparation is the deduction of losses from passive activities without regard to the limits applicable to those losses. While rental real estate activities often generate passive losses, the passive loss limitation rules apply to a broad range of activities and are of particular concern to S corporation shareholders, partners, and members of limited liability companies. Furthermore, until further guidance is issued, the rules may be particularly tricky to apply with respect to LLC membership interests. 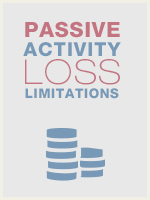 The objectives of this course are to provide the practitioner with a sound understanding of the basic rules related to passive activity loss limitations and their application in common scenarios. The course covers the relevant definitions and exceptions regarding passive loss limitations with which every tax practitioner should be familiar.